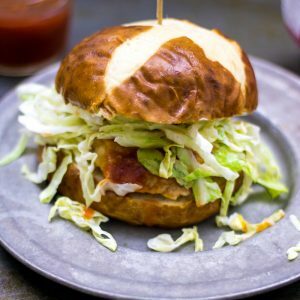 Barbecue Chicken Burger with Coleslaw: A hand-made chicken burger is seasoned with barbecue flavors, stuffed with cheddar cheese, grilled and basted in sauce and topped with a creamy slaw. 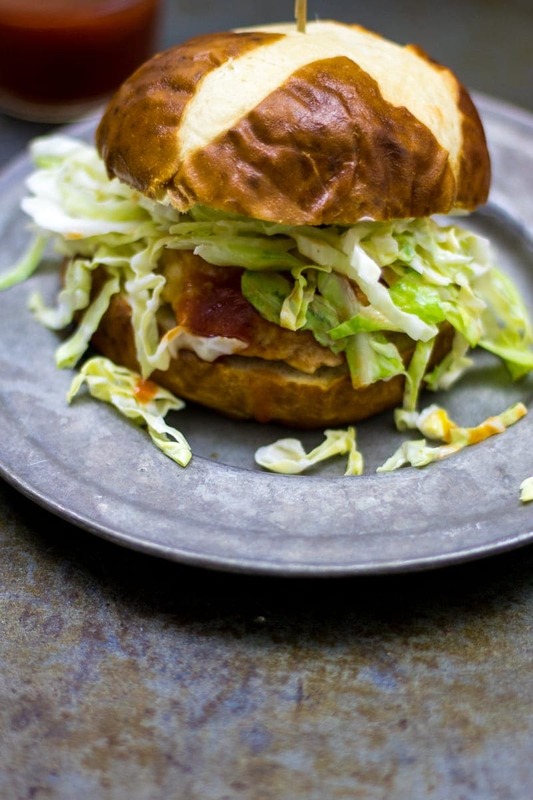 This easy chicken burger may just replace all burgers at your house! Grilling season is in full swing and we are grilling corn, potatoes, even berry crisp, but of course you must have burgers. And a beef patty grilled to perfection, smothered in cheese, and topped with lettuce, tomato, and onion, is always amazing and classic. But take a fresh chicken burger with an explosion of barbecue flavor in a lighter version of the classic American burger–it is pure perfection. I must admit the my husband was not thrilled to hear that I was making chicken burgers instead of beef patties. He was afraid they would be dry and flavorless–and I get that! There have been many experiences with dry chicken in both our lives–I am betting yours too! The players in this homemade chicken burger are simple: ground chicken, diced cheddar cheese, garlic powder, salt, pepper, your favorite barbecue sauce, homemade coleslaw, and whole wheat buns. The sharp cheese is diced finely and mixed into ground chicken breast with a bit of barbecue sauce. This keeps the chicken burger moist and flavorful. 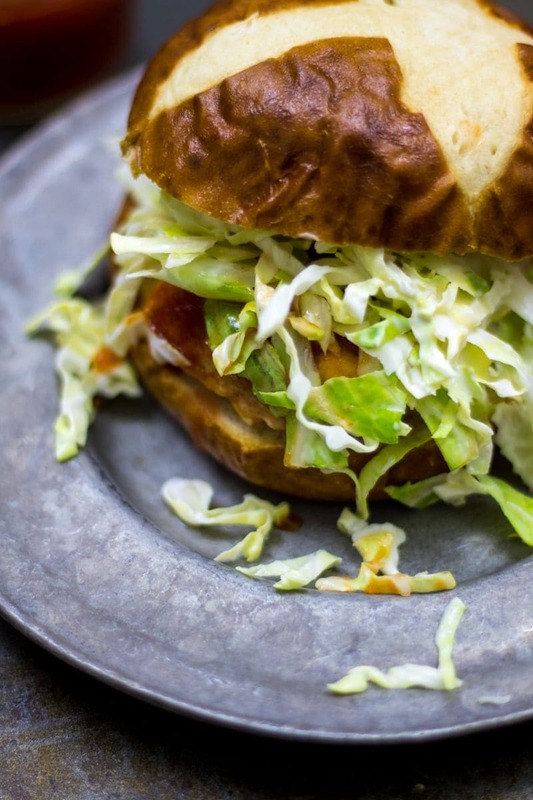 Then the creamy coleslaw is the perfect compliment to any barbecue, and finishes the burger to perfection. Gently combine the ground chicken with the diced cheddar cheese, seasonings, and a bit of barbecue sauce. Remember to NOT over mix your burger ingredients–this will make your burgers become tough! Divide the meat mixture into 4 equal portions and shape into patties. 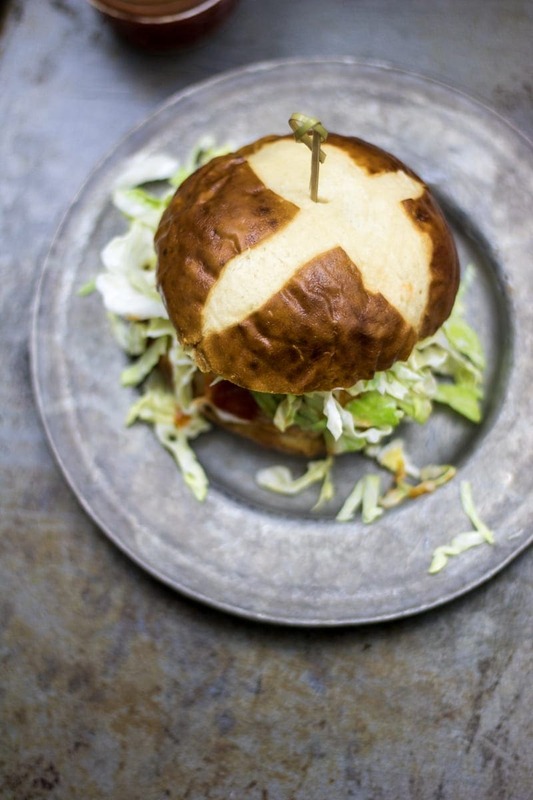 Place a thumbprint into the middle of each burger, to help prevent shrinkage and even cooking. Grill until the chicken has reached an internal temperature of 160 degrees. Remove chicken burgers from grill and smear the burgers with the reserved barbecue sauce on both sides. Tent with foil and allow the burgers to come to 165 degrees. Preheat smoker to 300 degrees. Place prepared chicken burgers on heated smoker. Place chicken burger on bun of your choice. At my grocery store, I would pay at least $5/lb for ground chicken and only $2/lb for chicken breasts, so making my own ground chicken not only saves me money, it allows me to know exactly what is IN the ground chicken (I can do a mixture of dark meat or all white meat, etc). To make ground chicken breast: Place one pound of boneless, skinless chicken breasts , cut into large chunks, into food processor and pulse until chicken is broken down enough to form into patties–this is only 5-7 quick pulses in my food processor. To make ground chicken with chicken thighs: Place one pound of boneless, skinless chicken thighs, cut into large chunks, into food processor and pulse until chicken is broken down enough to form into patties–this is only 5-7 quick pulses in my food processor. You can also do a mixture of both chicken breasts and chicken thighs. Tip: Be sure that the chicken is cold when processing–it will work a lot better. A hand-made chicken burger is seasoned with barbecue flavors, stuffed with cheddar cheese, grilled and basted in sauce and topped with a creamy slaw. Place chicken into large mixing bowl and add spices, ¼ cup barbecue sauce, and diced cheese. Mix together until just combined and ingredients are evenly distributed. DO NOT OVERMIX! Grill burgers for 7 minutes per side, or until chicken reaches 160 degrees. Remove chicken burgers to a plate and baste with additional barbecue sauce. Allow burgers to rest on a plate for 5-10 minutes before serving. Serve on top of bun (or bunless for low-carb or gluten free) and top burger with 1-2 tsp additional barbecue sauce and ¼ cup coleslaw on each burger. To smoke chicken burgers: Preheat Smoker to 300 degrees. Add in chips and let smoke for 5 minutes. Smoke burgers for approximately 40 minutes, or until they reach an internal temperature of 160 degrees, turning mid-way through cooking. Remove burgers and baste with barbecue sauce and tent. Rest for 10 minutes, to reach 165 degrees and then serve. If you love BBQ Chicken, check out Food Faith and Fitness’ BBQ Baked Chicken Spaghetti Casserole, it is a great gluten-free option. Thanks CJ for choosing my recipe to be featured!! To me, the slaw is what make the sandwich 🙂 Enjoy! That is sure a great basket of goodies, your BBQ Chicken Burger looks delicious! Hope you have a great weekend and thank you so much for sharing with Full Plate Thursday! That looks so yummy! Thanks for the great recipe and for linking it up to Tasty Tuesdays at Creative K Kids. I pinned it to the Tasty Tuesdays Pinterest Board. This burger looks amazing. Love the buns and the cole slaw topping! !